Over 7 years ago I made my first trip to the state of New Hampshire. I was going hiking with my crew team in the White Mountains. One of the most distinct features I noticed on that trip up was the motto on the car license plates “Live Free or Die“. It’s a simple motto, a distinct motto, a mott that represents the attitude of many native to the state. Yet it is a harsh motto compared to Maine’s Vacationland, Ontario’s Yours to Discover, Massachusett’s Spirit of America, Quebec’s Je me souveins. 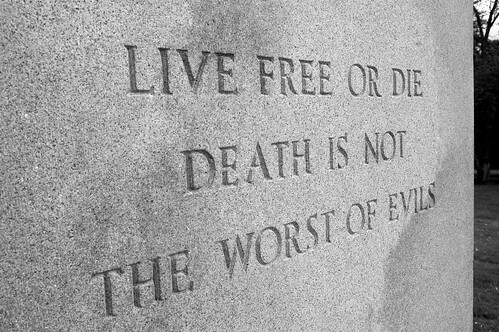 Live Free or Die is a matter of great pride to many native to New Hampshire. It comes from a toast given by a great New Hampshire Revolutionary war hero called General John Stark in 1809. 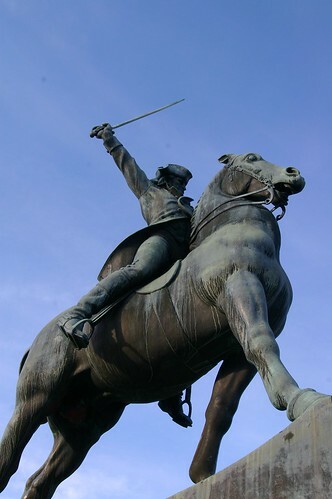 The picture above comes from the base of the John Stark equestrian statue in Stark Park. Stark park is one of the many sites in New Hampshire (and around the United States) that celebrate his achievements and life. I have a tumblr, I also keep a personal blog on livejournal and I have a Tumblelog about Octopus. I try to update my twitter at least once a day. I'm obviously on Facebook. I never use my myspace. I'm going to start using DailyMile more often as I get back into working out. I still read lots I've been using GoodReads more often lately, but like LibraryThing better. And of course there's good old E-mail.